This walk takes you away from the Puffers Cafe and encompasses history, scenery, industry and geography and attempts to portray the many faces of new and old Irvine. 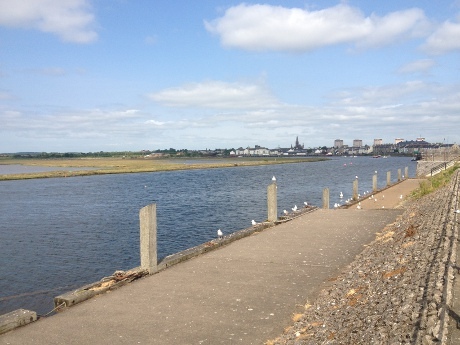 The currents within Irvine Harbour are very strong and there are warning signs in place against swimming. 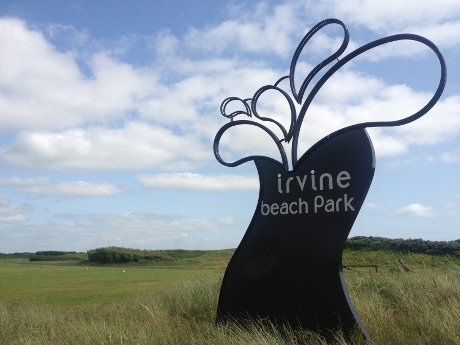 The water quality at the Irvine beach does not meet current European standards, though there has been massive improvements in the water quality in recent years. There are toilet facilities at the front Beach Park car park which are open during normal business hours. There is a range of Cafes, restaurants and shops within the harbour area. The Beach Park has great facilities for a picnic lunch and a good place to sit and relax while the kids play. The Beach Park also contains a play ground, a small skate park and some basic exercise equipment. The path on this route is very well maintained so is suitable for people of all ages and abilities. 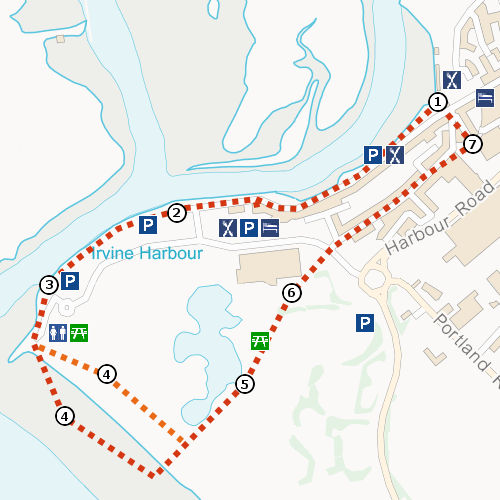 The route along the beach is not suitable for wheelchair users and those who require walking aids. The alternative route through the Beach Park is suitable for wheelchairs and those who requier walking aids. With the river on your right there is Puffers cafe and information centre. This is a popular lunch time rendezvous with the old clipper The Carrick behind. Having been lovingly restored it is now ready for its final journey to Australia where a similarly dedicated team of volunteers will continue its restoration. Further to the right views over the rivers Irvine and Garnock display some of the historic industrial past. ICI (Nobel division) famous for explosives (referred to as ‘The Dynamite’) this area is now an RSPB sanctuary and home to seals, wading birds and other wildlife. Looking across to Ardeer, Stevenson and Saltcoats the area of swamp and grasses can become a lagoon at high tide. You can stop and admire the boats and yachts that are scattered around the harbour. Continuing we pass an extremely busy coffee shop (Small Talk) where locals gather to enjoy the scenery and catch up with local news and gossip. 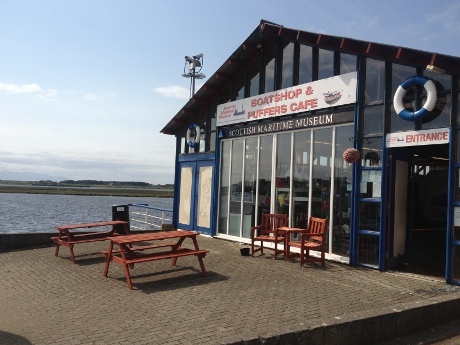 Across from the cafe you can enjoy an excellent panoramic view of the area and appreciate the two old ‘Puffer’ boats which are moored in the harbour and are part of the maritime museum. Further on we reach the Harbour Art centre –a real hub of the community with live shows/ music/ drama/comedy. It provides an Art Gallery and hosts a number of local groups meetings and conferences. Next to the Arts centre is The Ship Inn the oldest public house in Irvine (established in 1597) it is famous for its bar lunches and evening meals. Directly across is a favourite Horse and Carter commemorative statue of Irvine’s trade. When Irvine was in its heyday it was known as the 4th Port. It was one of the busiest harbours in Scotland with its cargoes of coal and raw materials for its emerging foundries all of which were landed at the harbour and hauled in to the town by the Carters and their horses. Next to the Ship Inn is an especially created art centre with a variety of individual studios housing craftsmen and artists where you can often watch the artists at work. As you approach the pier we can see the Harbour masters House and the bridge which used to cross over to the Science museum-The Big Idea-an iconic building which unfortunately closed in 2003. We are then confronted by the Pilot House-a most imposing sight. This automatic signalling apparatus was invented by Martin Boyd to identify to incoming vessels the rise and fall of the tides. Standing at the side of the car park you can now choose to walk along the sandy beach or to stroll through the Beach Park. Before moving on however take a moment to enjoy the open views sand dunes leading towards Barassie and Troon and an breath-taking views across the Arran. Head down the stairs at the car park onto the sand and follow the sand dunes along the beach until you can see a large stone dragon at the top of a hill on your left hand side. Follow the paths up through the dunes back into the beach park. Follow the path, keeping to the right of the boating pond. Follow the path around the building which contains public toilets and bear right into the Beach Park. Keep following the path keeping to the right of large boating pond within the park. The Beach Park is a large open public park that many local residents use for recreation and leisure activities. The park contains a range of exercise equipment which has been placed close to the paths that run around the edge of the boating pond. The boating pond itself attracts many different types of birds, including swans and is often used by local residents to showcase their model boats. Turning back towards the town see The Magnum subject of much local discussion due to its possible closure. Opened in 1975 it was one of the first Leisure centres in Scotland and it is still very popular with the local people and used extensively for a number of sporting activities including swimming football bowling and badminton. We are now approaching the end of our walk as we arrive at the Scottish Maritime Museum. This museum has recently reopened following an extensive renovation programme after flooding and storm damage closed it down. 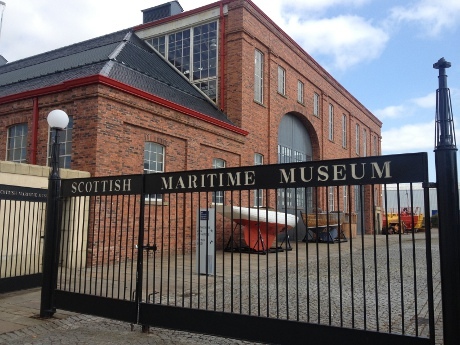 This museum is a truly remarkable portrait of the history of Irvine harbour and its links to the Govan and Glasgow shipyards. It is a tribute to ‘Scotlands cathedral of engineering’-The linthouse engine shop. It is hoped that the development and regeneration of the Harbourside will continue to showcase the wealth of history this area has to offer.